Many people consider our newest national holiday, MLK Day, to not be a “real” holiday. perhaps is too new, or just seems marginal for them. 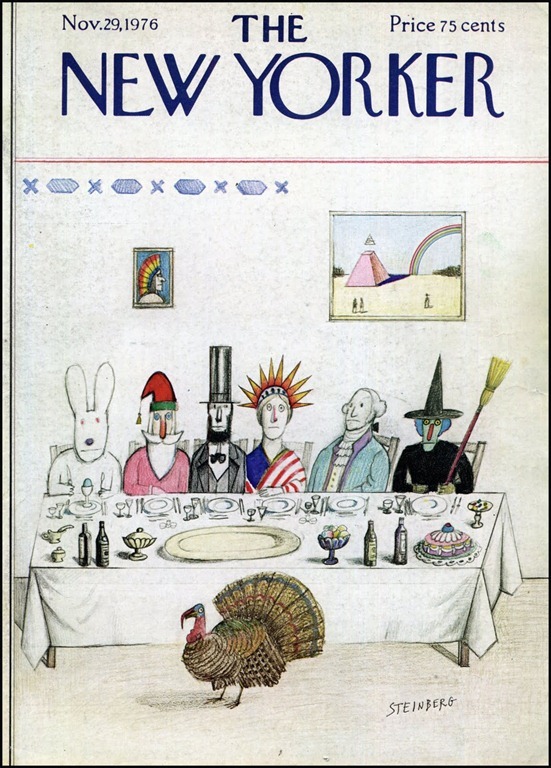 In Saul Steinberg’s celebrated “holiday” New Yorker cover, we have Washington and Lincoln, Santa Claus and the Easter Bunny (ready to eat a hardboiled egg! ), symbols of Thanksgiving and Halloween, and even Lady Liberty (representing perhaps Independence Day, Memorial Day, etc.) and an American Indian (representing perhaps Columbus Day). But there is no Martin King. Now, to be fair to Steinberg, MLK Day was not made a Federal holiday until 1986 (legislation was signed in 1983), so seven years earlier when Steinberg drew his cover, he could not have been expected to to draw in a representative of MLK Day. But in 2012 – our 27th national MLK Day, the holiday is only partly observed in the private sector. But I find MLK Day to be a serious holiday. Most history books argue that the American Revolution did not end in 1783, when the Treaty of Paris officially ended the Revolutionary War, or in 1787, when the US Constitution was signed. It did not even end in 1865, when the worst American war finally ended over unsettled issues in the US Constitution. It did not end in Reconstruction. Certainly, in the 1960s, when inequality was a de facto policy in large parts of the US, the American Revolution was not finished. King, as a brilliant rhetorician, was crucial in gathering diverse parties together to help address the unsettled issues. But more than that, King was crucial in setting down the basic parameters of discourse – unlike the 1860s, the 1960s were not to be time of mass violence. King showed us how we can have revolutionary cultural and political change without violence. Of course, the 1960s saw violence – and King lost his life to violence – but the basic pattern was set as non-violence. and compared to the US experience during the previous century – or to any number of other locations, US dialogue remains remarkably non-violent. Contra Robespierre (and those who later quoted him – Taft, Trotsky, etc. ), it turns out that you can make an omelet without breaking some eggs. It is popular today to mention King’s personal shortcomings: he may have plagiarized part of his doctoral dissertation; he had extramarital affairs. I do not think this in anyway subtracts from King’s contributions. King was not an academic or a scholar – he was a social leader. And if our history books were to be purged of all our “founding fathers” who engaged in sexual improprieties, we would have very few individuals remaining. King’s core contribution his successful leading of a non-violent campaign for civil liberties is as much a part of the American revolution as Thomas Paine, George Washington, Thomas Jefferson, James Madison, and Abraham Lincoln. King is a founding father of America. A quote carved in stone on the new Martin Luther King Jr. memorial in Washington will be changed after the inscription was criticized for not accurately reflecting the civil rights leader’s words. The inscription currently reads: "I was a drum major for justice, peace and righteousness." The phrase is chiseled into one side of a huge block of granite that includes King’s likeness emerging from the stone. It became a point of controversy after the memorial opened in August. A spokesman for the U.S Department of the Interior said Friday that Secretary Ken Salazar decided to have the quote changed. The phrase is modified from a sermon known as the "Drum Major Instinct," in which the 39-year-old King explained to his Atlanta congregation how he would like to be remembered at his funeral. He made the February 1968 speech just two months before he was assassinated in Memphis. In the speech, King’s words seem more modest than the paraphrased inscription: "Yes, if you want to say that I was a drum major, say that I was a drum major for justice. Say that I was a drum major for peace. I was a drum major for righteousness. And all of the other shallow things will not matter." Poet Maya Angelou previously said the truncated version made King sound like "an arrogant twit," because it was out of context. Salazar gave the National Park Service a month to consult with the King Memorial Foundation, which led the effort to build the memorial, as well as family members and other interested parties. The committee is supposed to come up with a more accurate alternative to the quote. Martin Luther King Jr. quotations are extremely important to get right. In the early 1980s, there began serious allegations that King was a plagiarist. This may deserve a post here at some point. In fact, what King does rhetorically with language deserves to be examined and studied and followed quite seriously. (One of my own projects has been to find variant texts of his letter from a Birmingham jail, which is one of the most reproduced essays for literary anthologies of essays ever. There are variant texts out there. I found at least three strains of the “Letter” in publication, two different versions published by King himself – one in the Atlantic Monthly of August 1963 now excerpted here on the Atlantic’s web site and another revised by him and his editors for a book in which he compiles some of his writings and speech transcripts). “Leaving it out changes the meaning completely,” is a profound and astute observation by Angelou. Variation within a statement may be acceptable, but variation of a statement can change everything and make it what it’s not. Thanks. On King and plagiarism: I am thinking of making to include a post today with a link to this report on King and the double standard his estate has in authorizing his words for others to use.